Some of you may use idea/sketch notebooks regularly to write down everything that comes to your mind and has value for you, ideas or sketches of something related with your passions. Ideas can emerge at any moment of the day, walking in the street, reading an article, talking to a friend… and it’s important to write them down at the moment you have them, because it may seem easy to remember an idea, but it’s not so easy to get it back, that’s what the notebooks are for. Some prefer to bring pocket-size notebooks everywhere, but I prefer an A5 size notebook, so I can’t carry my notebook always with me. What I do is write a note with some keywords in my smartphone just to remember what I have to write later. Because of my noteboks’ size, I usually write in my room’s desk, but my notebook is often somewhere else, in my bag or a shelf. It may sound ridiculous but I’ve noticed (or at least happens to me), that I write quite more often if I leave my notebook open at my desk. Sometimes you don’t get any ideas until you pick a pencil (or a brush) and place in front of a blank canvas. Also, I think it’s important to write only what you think it’s an idea (no matter if good or bad), if you want to write the shopping list or “TO DO” list, do it in another place, this will give more value to your notebook, even a little more motivation to get new ideas. 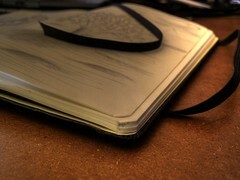 You can feel the same motivation buying a Moleskine, but it’s the content what will make your notebook valuable. So if you need more ideas, no matter if you’re a musician, photographer, programmer, don’t just place the notebook on your desk, leave it open.